The class struggle in rural Venezuela has sharpened as communal activists challenge corruption and private interests in the battle to produce food. Venezuela remains in the grip of crisis. Oil production has dropped to 1.3m bpd (from 3m in 2005). GDP has contracted for 17 consecutive trimesters, a loss of over 40%. The parallel market spirals into hyperinflation with price hikes of around 100% per month for foodstuffs and household goods absent from the shelves of state supermarkets which have fixed prices. The value of the national currency has plummeted with one dollar worth over 3m bolivars on the streets and illicit DolarToday websites. On the floating official DICOM rate one dollar is worth 114,000 bolivars whilst it is fixed at 10 bolivars per dollar for preferential imports. As detailed in FRFI 260, the PSUV government hands billions of highly subsidised dollars to private importers and multinational monopolies for food, medicines and other basic goods, but instead of an abundance of subsidised products, these are diverted, smuggled, hoarded for speculation, sold illegally on the parallel market or the dollars are stolen, and the goods never even imported. A shortage of physical currency (with the ratio of cash to total money supply at 1.8%), and ever more elaborate money- laundering schemes at the border, mean more Venezuelans rely on debit card payments, which come with additional illegal charges of 100-300% in many private outlets. The result is crippling inflation and scarcity for the majority with many surviving through informal street selling and urban garden farming. Estimated capital flight topped 100% of GDP in 2016 as the rich deposit their dollars abroad. Though China has just agreed a further loan of $5bn, Venezuela has foreign debts of $8bn to pay this year, plus $4bn for debts that have matured. US sanctions are already cutting off access to loans and debt restructuring, meaning the spectre of default is ever present. Similarly, the EU has imposed new sanctions on Venezuelan officials, strengthening the US stance. Venezuela is increasingly isolated as the continent shifts rightwards. Neighbouring Colombia has become the first Latin American nation to join NATO and newly-elected President Ivan Duque wasted no time in meeting with US Republican senator Marco Rubio, Vice President Mike Pence and Secretary of State Mike Pompeo to discuss ‘the Venezuela issue’. Relations with Ecuador, a once staunch ally in the Bolivarian Alliance for our America bloc have crumbled as President Lenin Moreno has attacked the advances of Ecuador’s 10-year ‘Citizens’ revolution’ and backed an arrest warrant for its former leader Rafael Correa on baseless charges of kidnapping. Meanwhile Nicaragua’s Sandinista government, another ALBA ally, has been rocked by violent protests. The US National Endowment for Democracy boasted of spending millions ‘laying the groundwork for insurrection’ while USAID’s Nicaragua budget surpassed $5.2m this year. The result has been over 200 deaths and rampant destruction. Under these extreme pressures, Venezuela’s future hangs in the balance. Over the last 20 years the Bolivarian revolution has won successive electoral victories channelling oil revenues into social programmes and launching participatory systems of self-government in working class barrios and rural areas through communal councils and communes. Its massive gains include free universal health care, pensions, the tripling of university enrolment and the construction of over two million units of social housing. However, Venezuela remains dominated by capitalism with 70% of the economy in private hands, with oligarchs controlling banking, food distribution and private media. 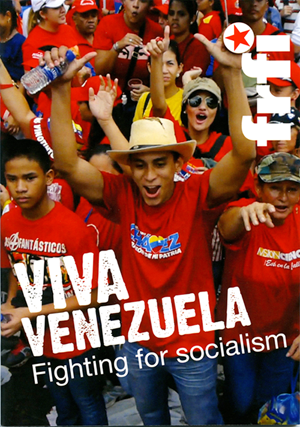 The Bolivarian process has been led by the PSUV, a cross-class electoral alliance containing revolutionary socialists alongside careerist politicians and conservative business leaders who have secured comfortable government posts and juicy state contracts they are keen to keep within the framework of Venezuelan capitalism. The government must restore oil production, take control of foreign trade and increase domestic agricultural production. Food production is central. A century of oil extraction in Venezuela has produced mass urban migration. The rural population has fallen from 68 % in 1941 to just 10% today. With around 30m hectares of arable land, agriculture made up a third of the economy in the 1920s but had dwindled to 6% by 2003. As oil extraction increased, successive governments turned to cheap food imports and the area of cultivated land fell to just 1.6m hectares in 1998 leaving 24m hectares in the hands of less than 1% of the population. Despite the small size of Venezuela’s rural population, land reform and food sovereignty have been central debates within the Bolivarian project. The opposition-linked Polar monopoly controls around 50% of commercial food distribution. Imported and processed subsidised goods like pre-cooked maize flour, coffee and pasta are scarce in state stores but can be found for exorbitant prices in private shops and street stalls. The Platform for Campesino Struggle (PLC) asserts that given the economic war, 70% of the food now eaten by Venezuelan families is produced by campesino collectives and urban farms. This gives the class struggle over land distribution in the countryside even more prominence. Socialist communes and cooperatives have been in the vanguard, with land occupations of idle estates, communal production and distribution networks organising to beat the economic crisis. This has brought conflict with large landowners prepared to use violence to retain control, but also with corrupt state officials, mayors and governors, keen to preserve their privileged positions. Late socialist leader Hugo Chavez announced a programme of agrarian reform in 2001 legalising the occupation and recuperation of unproductive idle land by organised campesinos, prohibiting the accumulation of land by latifundistas – large land owners. The Zamora mission and National Land Institute (INTI) were created and distributed 4 million hectares of mostly state-owned land. A further Land Law was enacted in 2005, giving preference to cooperatives and ramping up support for the occupation, break-up and takeover of large private estates. By 2009 a further 1.9 million hectares had been handed to campesino families and cooperatives. However, latifundistas, many of them solidly aligned to the opposition, responded with a campaign of violence, hiring paramilitaries and hitmen who assassinated over 300 campesinos between 2001 and 2006. Indigenous activists reclaiming ancestral land from cattle ranchers and illegal gold miners were also targeted with over 40 Yukpa people killed in the Sierra de Perija alone. In 2008 intensive monoculture practices by multinational agrobusinesses were outlawed and in 2010 Chavez nationalised several companies to form Agropatria – a state company tasked with supplying seeds and inputs to the agricultural sector. Earlier this year, Maduro brought the total amount of land redistribution to over 6 million hectares including 1.8 million hectares of land for indigenous peoples who form around 2% of Venezuela’s 32 million people but make up around 20% of rural communities. Despite these advances, the vast majority of land remains idle in private hands. Moreover, the legal status of the land that has been handed over remains precarious. The PLC argues that the process is incomplete in 90% (6,000 cases) of land recuperation in recent years, leading to a lack of security. It denounces bribes paid to INTI officials to stall the processing of land titles, whilst corrupt prosecutors accept money for eviction orders. Evictions and assassinations continue. In April right-wing paramilitaries torched a school, houses, tractors and crops of the Guasimal commune, Portuguesa, targeting 80 families who have produced there for eight years. In May two campesinos from a collective occupying idle land in Palo Quemao, Barinas were assassinated. This followed months of harassment reported to public authorities. Such crimes are often carried out with impunity. No action was taken and instead the community was targeted for eviction by Barinas police and Bolivarian National Guard (GNB) despite the land claim being in process by INTI. In Merida, following an INTI inspection of the Magdalena estate which found 94% of the land to be idle and fit for crops, a collective began cultivation in accordance with land law. However, in March, the GNB, under directions of the Merida INTI, arrested 32 campesinos including six pensioners, two cancer patients and a nursing mother and baby, detaining them for ten days. Maduro intervened, dismissing INTI Merida officials and handing over collective land titles, but the problem of corruption goes beyond this. The communes represent a collective alternative to bourgeois democracy and a cooperative form of economic production. Too often this conflicts with the personal fiefdoms of mayors and governors, from the PSUV and opposition alike. ‘La Bolivar La Bolivariana’ farm in Zulia has been occupied and farmed by five socialist councils made up of 500 families over the last six years. They have been evicted three times. The land was seized by the state in 2008 but then awarded to the private company of Maria Malpica – PSUV mayor of Colon, who left it idle. After a protracted struggle the land was finally awarded to the campesino councils last year. Similarly, the El Maizal commune points to sabotage after last December’s mayoral elections where their delegate, Angel Prado, was barred from standing by anti-democratic forces within the National Constituent Assembly. His rival, PSUV mayor Jean Ortiz, set up a landfill site next to an El Maizal farm which quickly led to fires damaging huge areas of communal pastures and cornfield. El Maizal activists including Prado were then arrested in May on trumped-up charges of buying seeds from the unofficial market. The commune had been unable to purchase seed and fertilisers from Agropatria due to shortages leaving the corn-sowing dangerously delayed despite illegal traffickers driving through local towns with trucks loaded with Agropatria supplies – selling them for a hundred times the fixed price whilst state officials turn a blind eye. Further along the distribution chain, five trade union and communist activists were arrested in Nueva Esparta for documenting corruption in the local CLAP subsidised food programme, linking the local PSUV mayor to a shadowy network of local business leaders. Despite Maduro encouraging grassroots price-checking, the activists were arrested after publishing footage of products from the CLAP programme, repackaged and sold for extortionate prices in private stores. Although the activists have been released no action has yet been taken against any officials. Campesino communes often exemplify the popular participatory democracy that the Bolivarian Revolution champions. El Maizal is made up of 22 communal councils organised into a citizens’ assembly and communal parliament to ensure transparent democratic planning and implementation. Distributing products to the local community and CLAP programme, it harvested 4,000 tonnes of corn last year alongside beef, pork and cheese, combining this productive capacity with political mobilisation, holding regular rallies and recent occupations of Agropatria stores to denounce corruption and diversion of state resources. Stepping up pressure, the Bolivar Zamora Revolutionary Current (CRBZ) within the PSUV has staged occupations at the headquarters of INTI, demanding justice for assassinated activists and legal guarantees for recuperated land, whilst the ‘admirable campesino march’ winds its way through states to Caracas to deliver a set of demands to Maduro to resolve such rural issues in favour of revolutionary forces. Although there are inevitably attempts to paint El Maizal and the CRBZ as opposition agitators, they both mobilised for Maduro in May’s presidential elections. In response, Maduro has called for an end to land evictions and tasked the constituent assembly with addressing input shortages and investigating state repression and political violence, incorporating campesino collectives from seven key states. Some land titles have already been granted as a result. This illustrates that the Bolivarian project must be driven forward by popular revolutionary pressure if it is to advance in its aim of constructing socialism.